In 1994 three cave explorers (speleologists) came across a cave on private land full of paintings estimated to be 30,000.00 years old. The owners of the land in which the cave was located sued for compensation when the French Government appropriated the land but were only awarded the value of the land and not for example their claim to lost tourism income. The three cave hunters who had taken photographs and video sued the French Government with some success for breaching the discoverers’ rights of reproduction in using their photographs and video without authorization in order to promote the find. Your copyright in your photographs matters. 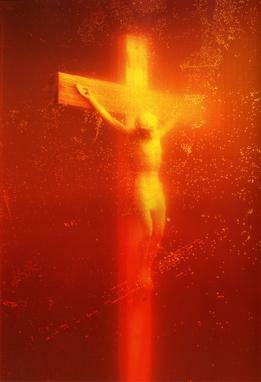 During a retrospective of Andres Serrano’s work at the National Gallery of Victoria in 1997, the then Catholic Archbishop of Melbourne, George Pell, sought an injunction from the Supreme Court of Victoria to restrain the National Gallery of Victoria from publicly displaying Piss Christ (on the basis that it was blasphemous), which was not granted. A few days later, one patron attempted to remove the work from the gallery wall, and two others later attacked it with a hammer. The director of the NGV cancelled the show, apparently because of his fears for a Rembrandt exhibition that was on display contemporaneously. One issue the case raised was how expansive was the private right (of someone like George Pell) to sue for a public wrong (being the tort of blasphemy). I couldn’t help thinking at the time that the artist was a bit like the seller of “holy relics” in Chaucer’s Canterbury Tales and that really it was a huge hullabaloo over an artwork that had “gimmick” value because of its controversial nature. I felt it was marketing of the artist more than anything else – and therefore a highly corporatised situation. By buying into this situation, those members of the Catholic church who either condemned the work or engaged in its destruction ultimately served the purposes of this already controversial artist.